Home keeper Craig Lawrence was involved in a mix-up for the first goal. Central Ajax suffered their first home Midland League Division Three defeat of the season on Saturday, going down to a 4-1 defeat at the hands of AFC Solihull. It was another case of starting too slowly but unlike the previous two weeks when Ajax had successfully fought back, this time around they gave themselves too much of a mountain to climb. 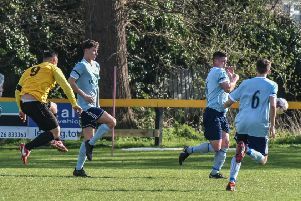 AFC Solihull opened the scoring after capitalising on an early mix-up between goalkeeper Craig Lawrence and centre-half Adam Trinder, Andy Matthews poking the ball home from the edge of the box. The two-goal deficit kick-started Ajax and both Craig Robins and Matt Layton should have reduced the deficit before Layton latched on to a poor kick out from the visitors’ keeper and passed the ball into an empty net in the 18th minute. Lawrence made a smart stop in a one-on-one before the games’ turning point arrived eight minutes before the break. Matt Trinder seized on another poor kick out and was upended in the penalty area but Layton had his low spot-kick saved by Dan Wright in the away goal. Solihull effectively killed the game off ten minutes into the second half,Jon Hamer scoring on the counter after a home corner. The visitors put the icing on the cake in the closing stages when their winger beat three Ajax players and crossed to present Ben Whitmarsh with a tap-in.